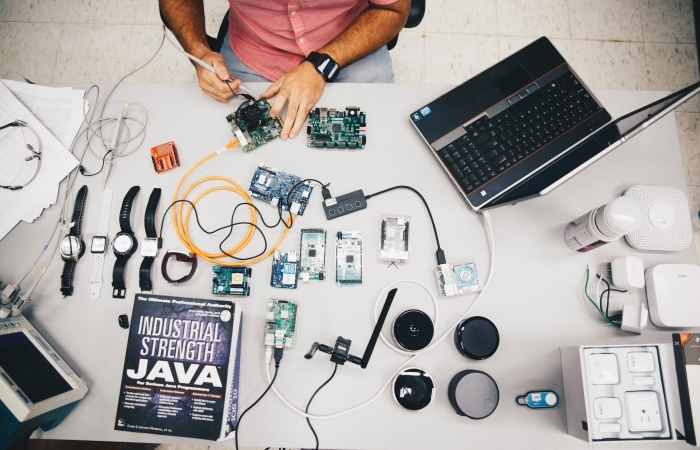 FIU’s Cyber-Physical Systems Security Lab. Leonardo Babun can’t wait to face challenging cybersecurity projects once he graduates. And thanks to a new scholarship-for-service program that gives him the necessary tools and training to be successful, he’ll have multiple opportunities to work for the U.S. government. Ten years ago, Babun – a doctoral student in the Department of Electrical and Computer Engineering – arrived in the United States from Cuba not knowing a single word in English and with only $100 in his pocket. Leonardo Babun, a doctoral student in the Department of Electrical and Computer Engineering and recipient of the CyberCorps Scholarship. Today, he is part of the CyberCorps Scholarship for Service, which provides him a full-tuition scholarship, an annual stipend for living expenses, annual separate funds to reimburse books and healthcare fees, and a job in cybersecurity for a federal, state, local or tribal government organization upon graduation. The CyberCorps Scholarship for Service program is funded by the National Science Foundation (NSF) and co-sponsored by the Department of Homeland Security (DHS). It provides education and job opportunities for engineering students enrolled in the Department of Electrical and Computer Engineering who have a strong interest in cybersecurity. CyberCorps is offered nationwide at 70 colleges and universities. 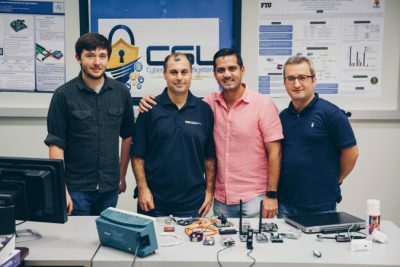 Selcuk Uluagac, assistant professor in the Department of Electrical and Computer Engineering, was instrumental in bringing the program to FIU this summer. For Babun, moving to this country with his family meant pressing the “reset button,” and in doing so, he discovered his passion. Babun got the chance to work with a hardware company in Miami in 2008. Although the company was slowly closing departments and letting go of employees, he took advantage and moved around working various technical positions within the office. It was while working on hardware-related projects that he developed an interest in the software side. In 2015, Leonardo received his master’s degree in electrical engineering at FIU and started his Ph.D. as part of a program sponsored by the U.S. Department of Energy. A year later, Uluagac told him about the CyberCorps program. Once Babun completes his Ph.D., he hopes to obtain a full-time position in a federal agency or research lab as a cybersecurity professional. He also would love to continue doing research and somehow be involved in an academic environment. Kyle Denney, Dr. Selcuk Uluagac, Leonardo Babun and Enes Erdin (another recipient of the CyberCorps Scholarship). Cybersecurity jobs have grown immensely in the last few years and will continue to. The Bureau of Labor Statistics Occupational Outlook reports that jobs in the cybersecurity field are expected to grow 37 percent from 2012 to 2022, according to Cyberscoop. The CyberCorps program also features professional development training and exposure to job fairs. Kyle Denney, another CyberCorps recipient, finds this truly important. “I recommend any student interested in cybersecurity to apply to this program. Cybersecurity is very popular right now in the government field and even as a student, I’ve already made connections with government officials. It really opens a lot of doors and job opportunities,” said Denney. Colleges and universities throughout the United States are selected by NSF through a competitive process for the CyberCorps program. 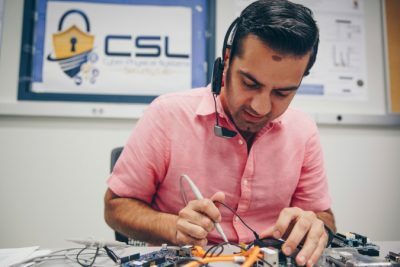 FIU participates in the program through the generous support of NSF and the co-sponsorship of the Department of Homeland Security due to FIU’s strong existing academic program in cybersecurity education and research.